The planets must have been in alignment when Buddy Young, director of residential services at Lake Junaluska and Candace Stimson, Low Impact Development (LID) student at Haywood Community College became acquainted. Stimson and her LID 112 class began working with Lake Junaluska on stream bank enhancement, storm water runoff and erosion problems last fall. 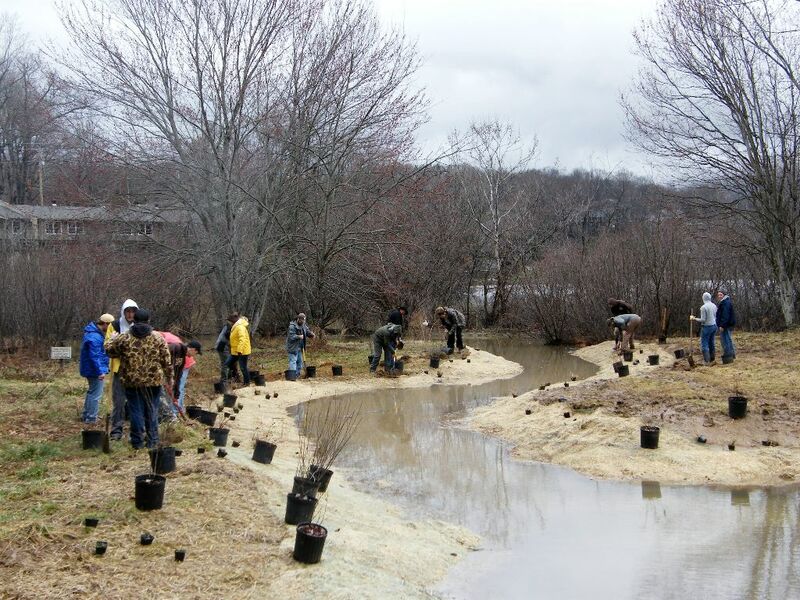 To fulfill her capstone project and become one of HCC’s first LID graduates, Stimson designed, coordinated and implemented the enhancement of Suzy’s Branch on the grounds of Lake Junaluska at the new wetlands site behind Jones cafeteria. According to Young, Suzy’s Branch had been piped, underground, through culverts to the lake. Stimson’s project removed 75 to 100 feet of culvert and created a course for the stream to flow through the wetlands. Stimson worked with Dave McKay of RCF Construction to complete the needed excavation and grading. She worked with Southeastern Native Plants of Candler to come up with a native plant list for the wetlands, including wetland plants like fothergilla, arrowhead, blueflag irises, dogwood, muskingum sedge and others. Stimson said she was glad to find the muskingum sedge because it is endangered in Tennessee and old range maps list it as native in east Tenn. She said plants don’t really know where east Tenn. stops and Western North Carolina starts. Stimson said this new design and new wetlands has many environmental benefits. “The wetlands will act like a filter to help keep sediment and other pollutants from reaching the lake. It will also provide new habitat and increase the diversity of wildlife,” she said. Tamara Graham, natural resources LID instructor at HCC, said that Stimson’s project at Lake Junaluska embodies both the principles of HCC’s LID curriculum and the principles of HCC’s capstone program. Graham said HCC’s LID curriculum grew out of the Mountain Landscape Initiative and focuses on site-specific practices that can have far-reaching effects. In other words if everyone controlled and/or mitigated erosion and pollution problems on their own property the cumulative effect would be much less. And student’s capstone projects are designed to be real on-the-ground examples of how low impact development benefits the community and the larger landscape in general. She said that Stimson’s project met both of those criteria. Stimson, who had worked in the nursing field for ten years, said that the LID curriculum at HCC was a godsend. “I’ve always cared about the environment. I love plants and working outdoors. The LID program at HCC brought it all together, I can follow my heart and work to heal the earth at the same time,” Stimson said. A LID classmate of Simpson’s, Vicki Eastland, focused her capstone project on rescuing native plants from the construction site of a new creative arts building on the HCC campus and introducing them into appropriate habitat on campus. It does this old hippie heart good to see people who care enough to change their backyard. When all our backyards are perfect – the world will be perfect.